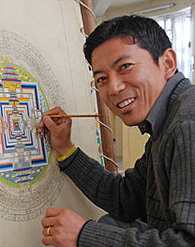 As part of its ongoing programming in Tibetan arts and culture, Emory welcomes Tenzin Norbu, master thangka painter of Norbulingka Institute in Dharamsala, India, back to campus for his second residency. The visit is made possible through the support of the Shelley and Donald Rubin Foundation, the Emory Tibet Partnership, the Department of Religion, the Graduate Division of Religion, the Center for Creativity and Arts, the Visual Arts Department, and the Carlos Museum. Accompanying Norbu is Dolmakyap Zorgey, deputy director of Norbulingka Institute, the premier Tibetan fine arts training and research center for the preservation of the Tibetan traditional arts. During their five-week residency, Norbu and Zorgey will share the art of Tibetan scroll or thangka painting with Emory and the larger community. Thangkas (pronounced TAHNG-ka) are a traditional art form used by Tibetan Buddhist practitioners to help them focus on a meditational deity. The earliest thangkas date to the 7th century CE when Buddhism first came to Tibet. The images on the scroll painting can be elaborate or simple, and can include scenes from a life history, landscape details, mandalas or elements of local history. While the Tibetan artists are in residence at Emory, they are sharing their expertise with Emory and Agnes Scott classes, teaching a public thangka painting class on Saturdays, and conducting a number of public demonstrations and discussions, including several as a part of Emory's Tibet Week programming. They are also teaching at Decatur High School and the Global Village School, an independent school for refugee girls in Decatur. On their first day at Global Village, the teenage girls found themselves on common ground with the Tibetans, who recounted the stories of their dangerous journeys from Tibet to India. Over the five weeks, the girls are learning the role of thankgas in Tibetan Buddhism, and learning to paint images of the Buddha in the traditional Tibetan manner. "Norbu is lovely in his manner - just coming and sitting with each girl and talking to them about what they are learning and doing," says Robey Tapp, art teacher at the Global Village School. "It is such a gift to them to see these people who are trying to preserve their culture through art. Just coming with sketch pads and pencils and saying, you get to keep this, is so meaningful to these girls whose families are struggling just to put food on the table." To see the master painter at work, stop by the Carlos Museum this week, from 10 a.m. to noon or 1 to 4 p.m. The Tibetan artists will also take part in a March 22 lecture by Rebecca Bloom, assistant curator at the Rubin Museum of Art, on "A Visual History of the Dalai Lamas." Afterward, they will discuss several thangkas depicting the lives of some of the previous Dalai Lamas. These thangkas, which they have brought from Norbulingka Institute just for the duration of their residency, have been commissioned by the current Dalai Lama and are rare and unique works of art.